Restored pianos are a wonderful, cost saving alternative to buying new. Pianos are so well engineered and constructed that they can be successfully restored to a like- or even better than – new condition. There are several factors to consider which include the worth or value of the piano after the work is done, assurance that your expectations will be met or surpassed and, most importantly, who will be doing the work. 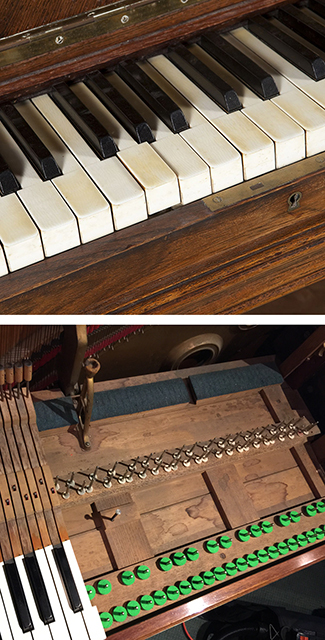 Restoration incorporates three separate aspects of a piano; Case Refinishing, Restringing and Action Rebuilding. Refinishing a vintage piano is more likely to be a better finish then the piano had originally. When pianos are manufactured, one of the biggest concerns for the factory is how much time is spent at each stage of the process. Finishing the case is one of the areas they can shortcut and this won’t be noticed for several years after delivery. We spend more time and material cost than the factories do in hand sanding, polishing and many coats of real lacquer. Restringing is much more than replacing the strings. In grand pianos the iron harp is lifted out of the case, re-guilded, lettered and receives new aggraffes. If needed, the pin block may be replaces to bring the tone and tuning stability to the highest standard. The soundboard is refinished, new decals are placed and any artwork is redone. The harp is then reinstalled and strung. Finally, new damper felts are installed. Action rebuilding normally includes all new action parts, Back Action repair or replacement, all new under-key felt, key rebushing and meticulous reinstallation of the action back into the piano. Then, much attention is given to fitting hammers and voicing. When all this is completed, you have your piano back – or one of our restorations we offer for sale – in a condition and at a level of performance satisfying to the most discerning player. It’s been said that “Any piano is only as good as the last person to tune & work on it “. This is so true. This ongoing commitment of the tuner-technician and the owner/player includes Tuning, Action Regulation & Hammer Voicing. About a year ago, I started asking random tuning customers and prospective buyers visiting our showroom, “How many strings does the hammer strike when playing a note?” A surprising number of people had no idea, and some of them were players. When you consider how basic a question this is, then it is no surprise that the many complex mechanical and aesthetic relationships involved in the proper function & tone qualities of a piano are unknown to them as well. For over sixty years, The J-B Piano Company has been committed to achieving the highest level of performance in the pianos we sell or work on in homes, studios and concert halls. We like to inform those interested to know what those possibilities are. Many people are very pleasantly surprised at how great a difference and improvement can be made for reasonable cost to them. Currently, we have three excellent tuners to get your piano sounding and playing to your liking. One of our J-B Piano Company staff will come out to your home and appraise your piano’s value. use it for a trade in on a better piano or to find out what work it legitimately may need to perform to it’s potential. 3. We do appraisal work for insurance companies as well as private clients, and provide a physical certificate which would help determine a resale value. 4. We charge for our time and expertise, which varies in cost depending on location and extent of the documentation required. However, we can often help you over the phone with an initial call or email with a photo. If you decide to restore your piano, the cost of appraisal is applicable towards restoration work. We service the entire San Francisco Bay Area and beyond.